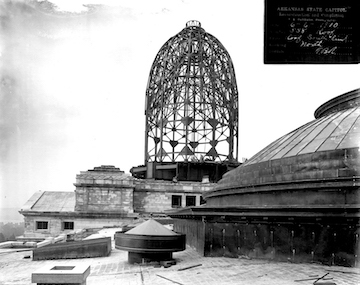 This exhibit, located in the Lower Level elevator lobby, features rare photographs taken at a crucial time in the construction of the Arkansas State Capitol. The work of Little Rock photographer Thomas B. Rayburn, the image document the condition of the structure in 1910 as a new governor and a new architect took charge of the struggling project to guide it to completion. Featuring historical photographs, blueprints, cartoons and newspaper articles, this exhibit chronicles the construction history of the Capitol, along with a look at 20th century governors and their impact on state and national events. The exhibit is located in the northwest hallway of the third floor. Explore Arkansas’s role in Major U.S. Conflicts and discover stories about our state’s heroes. View memorials to Desert Storm and Pearl Harbor veterans. The exhibit and memorials are in the fourth floor east corridor. Looking for a relative who served in the Arkansas legislature? Composite photographs of each legislative session since 1911 are located on the third and fourth floor hallways. House of Representative composite photographs are on the north ends of the third and fourth floors; Senate photos are on the south ends of both upper floors. Photos are in chronological order with the newer photos located on the third floor and the older photographs on the fourth floor. This exhibit highlights the lives of social justice and civil rights advocates Daisy and L.C. Bates, and the making of Testament, a monument on the Capitol grounds honoring the Little Rock Nine. It is located in the north foyer on the first floor of the State Capitol, overlooking the monument. Learn the history behind the official symbols of Arkansas. Located in the west corridor of the fourth floor, this exhibit is fun for allages. See how the state’s people and industries have changed from territorial days to today. A timeline of major events in Arkansas history is coupled with population s changes since the 1820s. The timeline and narrative depict landmark events since Europeans first explored the region in the 1500s, how Native American cultures shifted and the progression of agriculture and industry through today. Located in the southeast corner of the Capitol’s fourth floor.